The Bermuda International Film Festival has appointed Bermudian Andrew Stoneham to its helm. Effective immediately, Mr Stoneham, 29, will lead the organisation in delivering the 18th edition of the annual festival next month [March 20-26]. Mr Stoneham first became involved with BIFF as a student volunteer in 2003 before moving into a part-time administration role during the following years, and was latterly promoted to Festival Operations Manager. BIFF has been without a Festival Director since Aideen Ratteray-Pryse, one of the organisation’s founders, stepped down in 2011. Since then BIFF has been led largely by a committee of volunteers supported by a number of key seasonal staff members. Mr Stoneham’s early involvement in BIFF inspired him to major in film at Full Sail University in Florida then to embark on a career as a filmmaker. His first short film, Coffee & Pie, screened at BIFF 2011 before going on to win several awards at overseas festivals, including the Golden Space Needle Award for Best Short Film at the Seattle International Film Festival, the largest festival in North America. It was also nominated for the Iris Prize, the most prestigious LGBT short film award in the world. Mr Stoneham’s most recent film, The Last/First Kiss, screened at a number of notable festivals including Palm Springs ShortFest, Urbanworld, and Martha’s Vineyard African-American Film Festival. Alex MacDonald, Chairman of BIFF’s Management Committee, said: “We are delighted to announce Andrew’s promotion to this vital leadership role. It was a joint decision, made by the Board of Trustees and the Management Committee, to formally recognise Andrew as the head of the festival. It’s a pleasure to be working with such a talented young Bermudian with a genuine interest in film; he is the ideal candidate for this role. “We have been without an official Festival Director at BIFF for several years, as we, like many charities, made the necessary changes required to meet the challenges presented by the difficult economic backdrop. 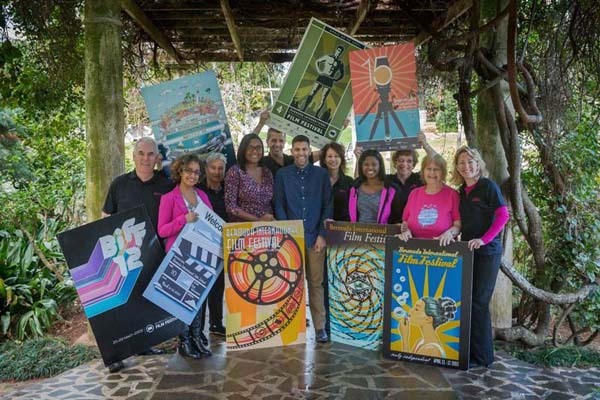 Andrew, along with our dedicated team of volunteers, has played an integral part in ensuring BIFF has retained its position as a key event in the Bermuda cultural calendar with a high quality programme, year after year. Mr Stoneham added: “My time at BIFF has been a great influence on me, personally and professionally, and I hope it succeeds in inspiring, informing and entertaining audiences for many years to come. “A lasting memory for me was meeting Mexican screenwriter Guilleromo Arriaga at BIFF 2004. He was on the jury that year and has written thought provoking films such as Amores Perros and 21 Grams. I was and am a huge fan of his work. He was quite a lovely fellow and very encouraging of my own interest in screenwriting. “Putting together the film programme is of course my favorite part of the festival. It is an honour and very fulfilling to have the ability to showcase such wonderful films to a highly appreciative audience. Our opening night film for BIFF 2015 absolutely made my top ten list of last year so I’m really looking forward to sharing it with everyone. The BIFF 2015 film line-up and further details of this year’s event will be announced to the public next week. Congratulations Andrew!!! Quite an accomplishment. Wishing you all the best of luck in your role which I know you will exceed in! Very proud of you. Congrats Andrew! All the best to you! Respice Finem! congratularions from New Jersey Andrew! Much success! !